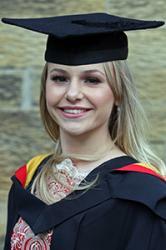 Laura ThomasA student whose life ambition to work as a midwife, has been fulfilled as she graduates from Bangor University this week. Laura Thomas, 21, from Rhewl Mostyn, Flintshire graduated with a BMd Midwifery degree, and now works for the Betsi Cadwaladr University Health Board at Ysbyty Glan Clwyd. The former Ysgol Treffynnon pupil had dreamt of becoming a midwife since a very early age. Laura was inspired by her godmother’s passion and enthusiasm as a midwife, which stemmed her interest in pursuing this career path. Laura explains: “I applied to Bangor University to study Midwifery whilst studying my A-Levels and was lucky enough to get a place on the course straight from high school. “Throughout my studies I was a member of the Bangor Student Midwife Society, elected Social Secretary in my second year, and Chair in my third. This experience helped me to build confidence and gain valuable experience of organising study days, conferences and fundraising events. “At the beginning of my second year, I wanted to leave the course as the workload and long shifts created huge anxiety. With help from University staff, fellow students, family and friends, I stuck at it and now I’m here, graduating because I persevered and completed it! 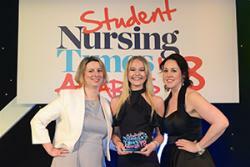 Laura winning the Student Nursing Times Student Midwife of the Year Award 2018 In May, Laura won the Student Nursing Times Student Midwife of the Year Award which highlights excellence in all specialities of student nursing. She has also been invited to join the 2019 Awards panel. Laura has been working as a registered midwife since October and looks forward to continuing her career here in north Wales.